With game mechanics, game designers are always looking to find the perfect balance between how powerful the effect can be and how difficult it is to pull off. A powerful combo or effect that is too difficult to achieve can be cast aside by the players as unattainable. A powerful combo that is easy to pull off can be fun, but it can also lead to problems during gameplay. Especially in a competitive environment. 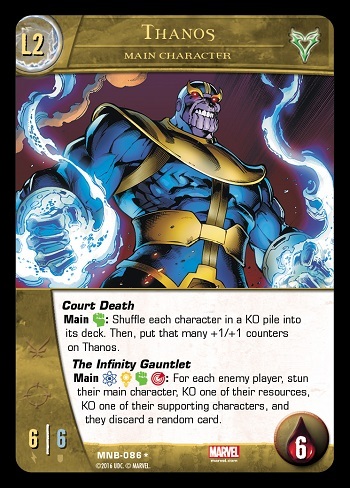 Danny Mandel and Ben Cichoski, co-founders of Super Awesome Games and designers of Vs System® 2PCG®, took notice of the Thanos Main Character cards from The Marvel Battles core set, and its effect on the first year of the game’s existence. Danny, the Lead Designer, had this to say about Thanos. Through interactions with players at events and through online posts, Danny and Ben were able to see first-hand that players wanted a change. Danny continued, “Our philosophy on errata is that it should only be used to clarify or fix the wording on a card. It should not be used as method to change the power level of a card. We feel that if a card is problematic it needs to be removed (i.e. banned from tournaments). Fortunately, since Vs System 2PCG’s sets come with fixed content, as opposed to the blind purchase of booster packs, we have an efficient method to bring back a problematic card in a newly re-balanced form. We want to keep some version of Thanos in the game because he’s such a popular character. Players must now KO enemy characters to level up Thanos. 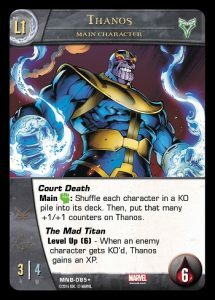 And while the Infinity Gauntlet is still powerful, its discard component is no longer a game ender. Besides a new image, this updated version is also discernable by the asterisk next to the card number. The next expansion to Vs System® 2PCG® will be a Marvel one. Titled Vs System® 2PCG®: Legacy, this set of 200 cards will expand on every Marvel team released so far for Vs System® 2PCG®. This includes The Marvel Battles, The Defenders, and A-Force. Each team will gain a new Main Character and a few Supporting Characters. Fan favorites like Captain Britain, Psylocke, Mister Sinister, Taskmaster, Squirrel Girl, and Elektra are expected in this March 2017 release. Upper Deck has plans for at least 2 more Marvel themed expansions, including one 400 card set, and at least 1 more from another license to fill out their 2017 calendar. Organized Play kits will also continue into 2017 with 3 more planned with releases of April, August, and December. Comment below on your thoughts of the Thanos update, or which character you are most excited to see. The Thanos changes allow the Gauntlet to remain extremely strong, but be game ending. His new levelup power gives the opponent lots of room for counterplay. Even though it’s kind of trivial, the artwork is a vast improvement as well. The road map for new releases is great as well, but it raises a couple questions. First, the AvP playmats at Gen Con led us to believe that Predator was going to be the next non-Marvel release. Does the vague phrasing “another liscense” mean that Predator has been pushed back further? If it has, can you tell us what this other liscene is going to be? Second, the next expansion contains only cards for existing teams. Should we expect that future Marvel sets will be either all legacy cards or all new cards? Or is it possible that an expansion could release with mostly new and a few isolated legacy cards? I meant to say that the Gauntlet remains extremely strong, but is NOT game ending. Can’t wait! How do I get updates on when these will be released? I am really hoping to see Moon Knight as a main character. any spoilers for the Vs Legacy March set? Do we have a release date for the new set yet? Any news on this release. It is mid March and I haven’t seen any new information since December 2016.